Ghost bike memorializing cyclist Tony Turner at the intersection of Roxboro Street and Chateau Road in Durham, North Carolina. What are the relationships between body, health, mobility and urban environments? What happens when these connections are out of balance? And how do traffic and mobility—by vehicle or bicycle—fit into this equation? These are some of the questions undergraduate students creatively explored this spring in Duke Global Health Institute assistant professor Harris Solomon’s Anthropology and Global Health seminar, which centered around the theme of injury, with ghost bikes as a case study. The course culminated in three final small group projects—a podcast, a community action event and a website. Each group focused on a different ghost bike in Durham, North Carolina. A ghost bike is a bicycle that’s painted white and left at a site where a cyclist was fatally injured by a collision with a motor vehicle. Ghost bikes serve as both memorials and reminders to motorists to share the road safely with cyclists. Each ghost bike has its own unique adornments, such as flowers, a photo, the deceased cyclist’s name or a written message. The first ghost bike was created in St. Louis, Missouri, in 2003; currently, more than 630 ghost bikes can be found in more than 200 locations across the world. The idea to focus on ghost bikes came to Solomon, an assistant professor in cultural anthropology and global health, through his own research project on traffic accidents in Mumbai, India. The National Science Foundation (NSF) CAREER grant that funds the project includes an educational component, and Solomon saw the seminar as an opportunity to bridge his research and teaching. He engaged his students in ethnographic research that explores the relationships between humans, health and urban environments—topics that parallel his research in India. Students considered the meaning of ghost bikes as memorials as well as statements about the challenges bicyclists face in traversing urban areas like Durham, where motor vehicles tend to rule the road and where urban density is rapidly changing. Students also explored the local controversy around of ghost bikes; a city policy established in 2015 enables the city to remove ghost bikes upon receiving one complaint. Solomon encouraged students to spend time conducting observations in the bike locations, writing and analyzing field notes, talking with locals and people with personal connections to the cyclist, learning more about the incidents that led to the cyclists’ deaths and meeting with city officials who set and implement local traffic and cycling policies. With support from the Franklin Humanities Institute’s new Health Humanities Lab, which Solomon co-directs, he also hosted a visiting scholar, Lochlann Jain, associate professor of anthropology at Stanford University. Jain’s research, which the students had been studying throughout the semester, focuses on how injuries often connect the fields of medicine and law in unexpected ways. Jain joined the class to discuss their own ghost bike research and to provide feedback on the students’ projects. Each group of students explored their assigned ghost bike through a different medium, including a podcast, a community action event and a website. What do ghost bikes mean to the family and friends of the deceased cyclist? How do ghost bikes impact the local community? Whom does the road belong to? Does a city have the right to remove these memorials? The project gave Jeremy Gottlieb ’18, a global health and cultural anthropology major and member of the podcast group, a deeper understanding of entanglements. For example, he said, “Seth Vidal’s ghost bike is intertwined with road infrastructure, car culture in America, the new focus on traffic accidents in global health, the Hillandale community and the lives of Seth’s friends and family.” And now, he reflected, he has a relationship with this memorial and is in his own way entangled with it. On April 21, the student group assigned to the ghost bike honoring cyclist Kent Winberry at the intersection of Duke University Road and West Chapel Hill Street held an awareness-building event on the Duke campus. They shared information with students about ghost bikes and cycling safety and solicited students’ help in decorating a ghost bike—borrowed from the Durham Bike Co-Op—with tissue paper flowers. The students plan to transfer the flowers from the bike to a wreath that will be placed on the actual ghost bike memorializing Winberry. A third group of students focused on the ghost bike at the intersection of Roxboro Street and Chateau Road, honoring cyclist Tony Turner. 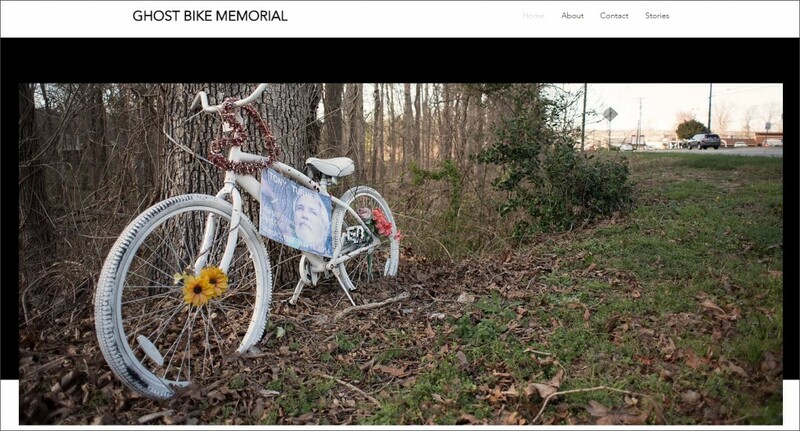 They created a website with information about ghost bikes and Turner, as well as photos and reflective essays related to the project. This summer, Solomon’s NSF grant will support an additional group of students to study the relations between traffic, injury, and mobility in Durham. The project, part of Duke’s Data+ program, connects students in cultural anthropology, global health, the Health Humanities Lab and the Information Initiative at Duke.